Let me just start this post by saying, I have a nanny. I never want to present myself as this “have it all together” working Mama who cooks tasty, healthy dinners every night in my little apron, serving my hubby this deliciousness on a silver platter. Not.at.all. In fact, last week I dropped the sorriest looking deli meat wrap on a plate with a few spoonfuls of jarred applesauce, took it too him on the couch and laughed as I told him “Bon appetit.” He gave me the most unimpressed look of, “Are you kidding me? Please tell me that’s not dinner?? ?” So yah, that’s real life. You win some, you lose some. But tonight, with the help of our nanny, (she preps, I pull it all together) it was a win kind of night! On the topic of having a nanny, let me just elaborate a little. I must also say, we have made some pretty focused financial decisions, giving up some luxuries so that I can have some help around here, get more time with the boys at night, and less time cooking and cleaning. I have a nanny 2 days a week. I absolutely love it because Jonah gets to stay home, and she not only takes really good one-on-one care of him, but she also does light cleaning such as dishes, laundry, dusting, and sweeping, and she preps our dinners that night. She also cuts up a lot of fruits and vegetables to help us on our healthy eating journey on some of the more time consuming tasks of healthy eating. You may be thinking “Well good for them for being able to afford a nanny.” Before you “judge” us too quickly, I might also add that we don’t have cable. We’ve actually never had cable since we’ve been married. We had flip phones until about 11 months ago, and we live in a three bedroom apartment. We also bought one of our vehicles at a yard sale two summers ago. So yes, we can “afford” a nanny, but only because it’s worth it to us above other things that might be worth it to someone else. So on to the real reason you are reading this post, the chicken recipe. 3. Spoon 1/2 cup of the mixture on to each chicken breast. 4. Roll the chicken up and put a toothpick in the top to hold it together. 5. 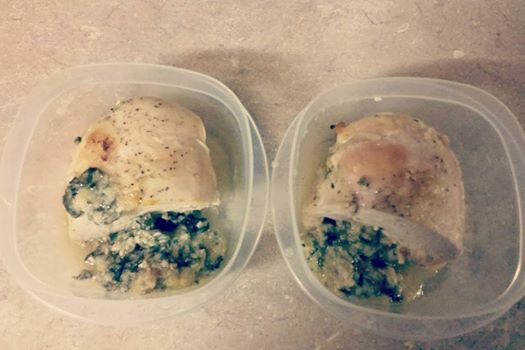 Place the chicken in a baking dish. Season with sea salt and pepper. Sprinkle the top with additional Parmesan if desired. Tip: Another option is to roll the stuffed chicken breasts in whole wheat bread crumbs. 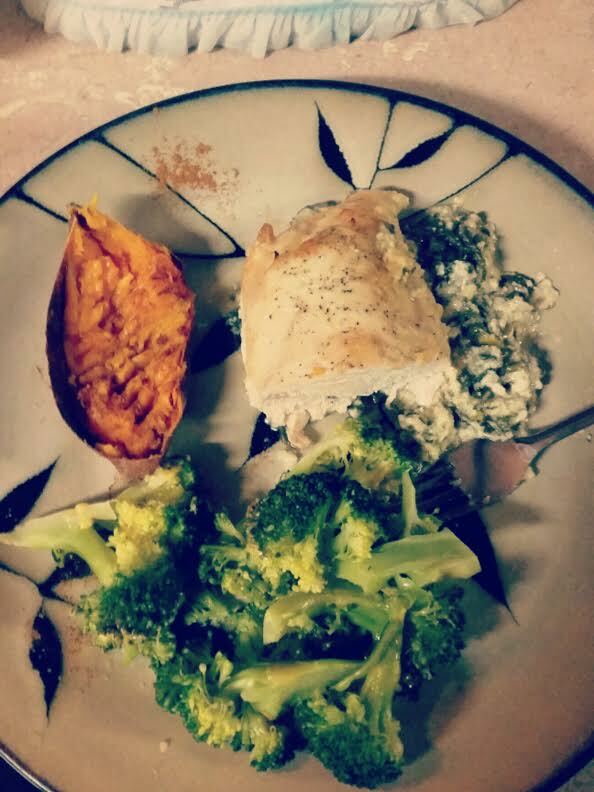 I served mine with a baked sweet potato topped with cinnamon and steamed broccoli. And the best part!!!! Leftovers for school the next day. When the nanny’s dinner lasts two days…it’s a good day at the Bisping House! I’m currently accepting members to my February online accountability group. If you’re interested in getting fit and healthy in February, please contact me via the form below.